Another week, another week's worth of burning and melting. This week was a bit of a hit or miss in regards to what I melted. I did have some good stuff though! Scent Description: Treat yourself to a freshly baked pumpkin cupcake covered in rich buttercream frosting. My Thoughts: I've come to realize I just can't do bakery scents. I like them on first sniff. They smell divine and scrumptious, but a little goes a long way for me. When I burned this I had enough of it after about 45 minutes. It's just too sugary sweet for me for long-term use. If you like bakery scents, you'll love this one. It has those sugary frosting notes along with the pumpkin. I can really only do these types of scents in small doses though. Scent Description: Add winter cheer with the crisp scent of mountain balsam, cedarwood bark & snow white cranberry. My Thoughts: I thought this maybe similar to Merry Mistletoe and it is in some ways. It has that holiday greenery note with a fruity note. I don't find this to be as sophisticated of a scent as Merry Mistletoe though. Merry Mistletoe has that champagne/effervescent and fruity note to it, whereas this just as a straight fruity note. Alpine Cheer is also has a lighter scent throw. It's a nice scent and if Merry Mistletoe never existed I'd probably love it. It's not different enough for me not to compare it to the far superior Merry Mistletoe. Merry Mistletoe is my scent god if you haven't realized that yet. My Thoughts: This is a dupe to the B&BW candle. I don't really remember the B&BW scent, so I can't compare. I just purchased this based off the scent notes. I like this, but nothing about it smells really fall-like or "Sweater Weather" to me. This to me is just a straight forward clean and fresh scent. 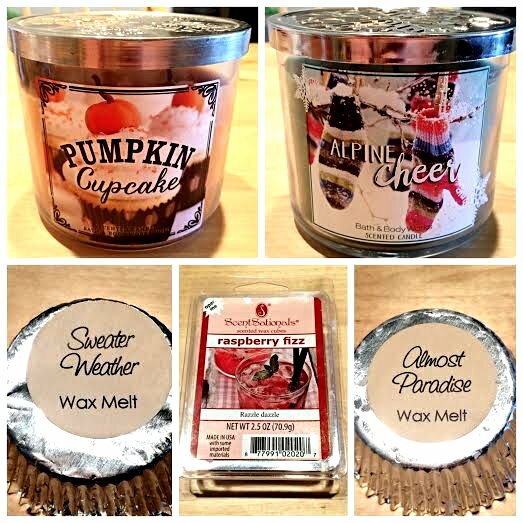 I love clean and fresh scents, but the name Sweater Weather makes me want a bit of something more to it. I'd probably like it more if it wasn't named Sweater Weather! My Thoughts: Love, love, love this scent! I love fruity/effervescent scents and this is exactly that. The raspberry in this is tart, sharp, and sweet and has that amazing fizzy note that makes this fragrance pop. I highly recommend this one! My Thoughts: This is a beautiful scent. This is the perfect blend of beachy, airy, and watery scents rolled into one. It is clean and refreshing with a hint of sweetness from the sweet grass. Beachy scents can sometimes go either suntan lotion, coconut, or some other tropical fruity mix. This has none of those notes which I'm happy about. This is just straight up beautiful clean ocean breezes.